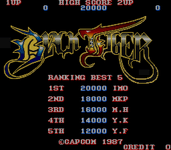 Source: Wikipedia, "Black Tiger (video game)", available under the CC-BY-SA License. A barbarian hero jumps and fights his way through a variety of colourful, enemy-packed levels in this spiritual successor to the Capcom classic Ghosts 'n Goblins. The sprawling, eight-way scrolling, two-dimensional levels are packed with hidden bonuses to encourage and reward exploration. Most of these bonuses are in the form of 'Zenny coins'; currency that allows the player to buy such items as an upgrade to their weapons and armour, keys for treasure chests, and anti-poisoning potions. Special items that reveal coins, upgraded armour, full vitality, extra lives, extra time, or simply bonus points may be found by attacking certain walls. The Japanese version has a few changes that makes it more challenging than its American counterpart. Several of the "falling rock" obstacles were added in this version. Additionally, the prices of many of the items are higher. But perhaps the biggest difference is related to fighting the later bosses (the 3 dragons and the dual sword wielding foes at the end of stages 5 and 7). In the American version, it is possible to duck and avoid taking damage when the bosses touch the player's character as long as one of their projectiles doesn't hit him. In the Japanese version, the player is not able to do this.